When our own Kenny Smith interviewed him over the summer for a story in that thing we did, Pat Sullivan, currently head coach at Samford, downplayed the importance of his Heisman Trophy in recruiting kids to play for the Bulldogs. * Was Tre Smith’s Touchdown Flip against Florida deliberate? War Eagle Pat and good luck this year to you and your team! War Eagle and good luck… most of the time. I’ll be at Samford’s first game this year, but I’ll be dressed in my Georgia Southern blue and screaming for my Eagles. 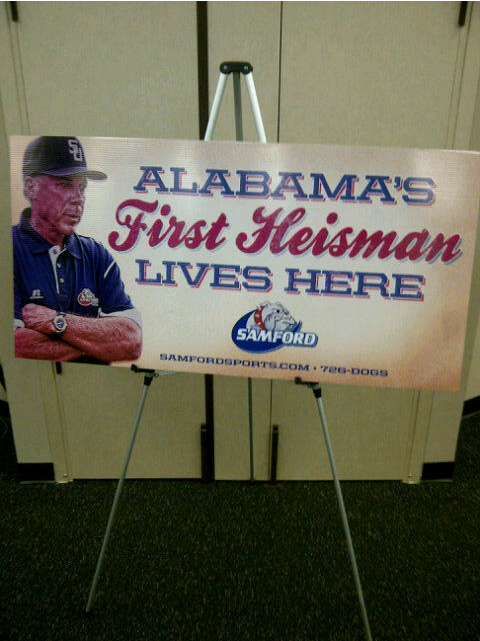 Anybody think they’ll do something special at the Homecoming game vs. Samford Nov 19th? Geez AU Elvis. It hasn’t occured to me until just now how awkward it will probably be for Pat to be the HC on the opposing sideline. But I have a feeling he’ll handle it like the class individual he is.